Agility and Intelligence for an Uncertain World. Every day, business leaders stare into the terrifying face of uncertainty, facing decisions that will affect their career, their employees and their shareholders. If everything didn’t depend upon, well…everything else. Since 1990, True North Leadership has used innovation, training, consulting and coaching to help leaders identify those surprises and unplanned events that -while inevitable- are usually ignored. We believe that leaders can be most successful by building smart organizations using emotional intelligence and agile leadership. The combination of these two disciplines creates organizational balance and can significantly reduce business surprises from the strategy and planning process. With the future less predictable than ever, our goal at True North is to eliminate risk from ongoing decision making and longer term planning. 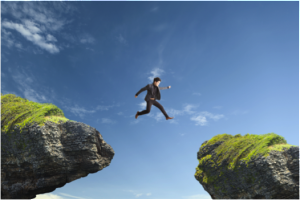 Our Organizational Agility (OA) training allows leaders to solve problems faster and better. We coach teams to use using innovations that emphasize speed, agility, collaboration and learning. The result of the OA training is to build organizations that can manage change, leverage disruption and eliminate fear of uncertainty. 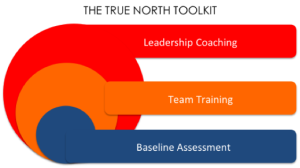 The True North Toolkit is built with a combination of Organizational Agility and Emotional INtelliegence. 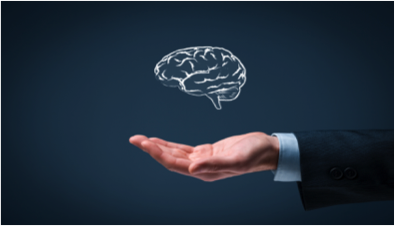 Emotional Intelligence (EI) training is based on the work of Daniel Goleman, the leader of the EI movement globally. His assessments, which are now part of the leadership mainstream curriculum, are the basis for a dynamic coaching program that begins with very innovative assessments of an organization’s leaders and their employees. Baseline assessments can be completed in two weeks with a team of less than ten people. Assessment of project teams can be completed in four weeks. Peak Performer training uses emotional intelligence and organizational agility to build results-focused teams of star performers. These teams are trained to use speed, scenario thinking and collaboration to generate a focus on customer, employee morale and radical process improvement. where star performers and their teams solve problems in a practice field environment, without risking company resources or budget. The program spans 12 weeks with an option to customize learning experiences for up to four modules during the year. The Leadership module is designed to help Senior Managers oversee and direct the growth of the management team. Run in parallel with the Baseline Assessment and Peak Performer module, the program provides mentoring and teaching skills to help leaders manage their teams personal growth intelligence and to maximize cross-team process agility. The program is conducted weekly in one on one and team learning environments for up to four 12 week modules. Benchmarking and personal leadership assessments are conducted every quarter and reviewed with the entire leadership. BMW Designworks, the design arm of the world’s most successful luxury auto company, moved its entire operation of 160 designers from 12 countries to Southern California over a six month period. With a new facility, no senior executive team in place and project teams and processes that were disconnected by language, cultures and work habits, the company had stopped growing and was among BMW’s worst performing business units. The challenge: How to train a new, inexperienced European trained leadership team, create trust and communication among groups that had not worked together extensively and put easy to manage processes in place that conformed with BMW’s demands of operational excellence. The solution: We coached and trained the new, 32 year old CEO Henrik Fisker (inventor of the Fisker Car and designer of the BMW Z8) to use his design background as a platform for leadership and innovation. We also trained his teams to think differently about process and teamwork. The result: In less than 2 years, Fisker: 1) created stronger roles for his line managers and tight accountability mechanisms to oversee their progress; 2) approved a set of more streamlined processes that allowed the design teams to use cross-functional resources, and; 3) fostered a cross cultural work environment that made the workplace inventive and creative, and: set up a succession plan that would make anticipated leadership transitions less disruptive to Designworks’ growth. Santa Barbara Bank & Trust, a 600 employee market leading regional banking institution that was acquiring smaller banks every quarter. Faced with potentially fatal problems tied to fragmented leadership, entrenched team silos and inconsistent processes, their senior management needed a new playbook. The challenge: How to break through a traditional, hierarchical, low trust organizational structure without creating employee turnover or decreasing aggressive growth targets. The solution: We helped a team of new leaders 1) build communication and accountability mechanisms in the organization; 2) integrate agile cross-training techniques to communicate and work more closely together; 3) develop a management succession plan that locked in the most talented managers long term and; 4) teach the management team to use scenario planning in their sales and marketing processes. The result: Until it’s merger with Union Bank, SBB&T was the most profitable regional bank in California with the highest customer satisfaction rankings in the region. Delco Systems, a division of GM Powertrain Group was tasked with integrating a new IT/technology provider- EDS/HP- into its West Coast California facility. With two individual CEOs onsite, the struggle for power and a single line of authority threatened to test the new alliance the two entities. The result: The joint operation was one of the first in the GM network to embrace the idea that people can be trained to be smarter using emotional intelligence as a foundation. As it began to grow quickly and rely more on digital technology, the studio acquired partners in the Palo Alto area to render and develop many of the effects for the films. Working remotely and with different work cultures in place, the film unit kept missing delivery timeframes and production budget estimates. The challenge: Without risking the costs of relocation and the retention of highly skilled employees, how could we create more trust, communication and efficiency and provide the managers of the project teams with the skills to be more smart and agile. The solution: We performed an organizational assessment and found where the real problems existed in the two operations. Based on the results, we created a teambuilding program that allowed for remote management of the Palo Alto unit while continuing to build a small team of leaders using EI skillsets. The result: Budgets and delivery times were met within six months of work and the Palo Alto facility stayed open, with no turnover of employees. Thoughtful Media Group, one of the largest online video content producers in the world, shifted it’s base of U.S. operations to China in order to catch the wave of an exploding population of 400 million Chinese viewers. With no staff or physical offices in place, the management was forced to build an entire work culture from scratch. The result: In just five years, Thoughtful has become one of the most successful content operations in China, delivering hundreds of millions of views to online audiences in China. Using the same model, Thoughtful has launched new operations in Thailand, Vietnam, The Philippines and Malaysia. 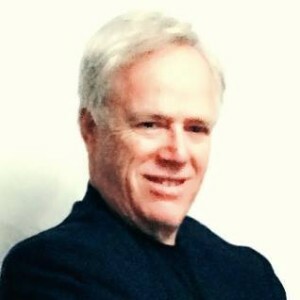 Terry Horsmon is the Global Managing Partner of True North Worldwide. Splitting his time between Shanghai, China and Santa Barbara, California, he has helped over 300 companies in 20 countries to prepare for the disruptions caused by uncertainty and unlanned events. Terry’s training, consulting and advisory programs are focused on building organizational agility and enhancing emotional intelligence. He is an expert in scenario thinking, agile techniques, process redesign and team building. Trained at Harvard Business School, MIT Innovation Lab (Systems Thinking) and Global Business Network (Scenario Planning), Terry received attended Amherst College and began his career as a consultant with McKinsey and Co.. He has held senior executive positions in the consulting, media, data analytics and entertainment industries. Over the years, Terry has built a global network of organizational and marketing resources- leadership trainers, data analytics experts, brand builders and content creators- who provide to Terry and his clients a broad value chain of strategic services. Terry’s industry clients have spanned all industries and include included such diverse companies as BMW, Ford, Nike, Medtronic, Deloitte Consulting, adidas, Burberry, Coach, Disney and Dreamworks Animation.